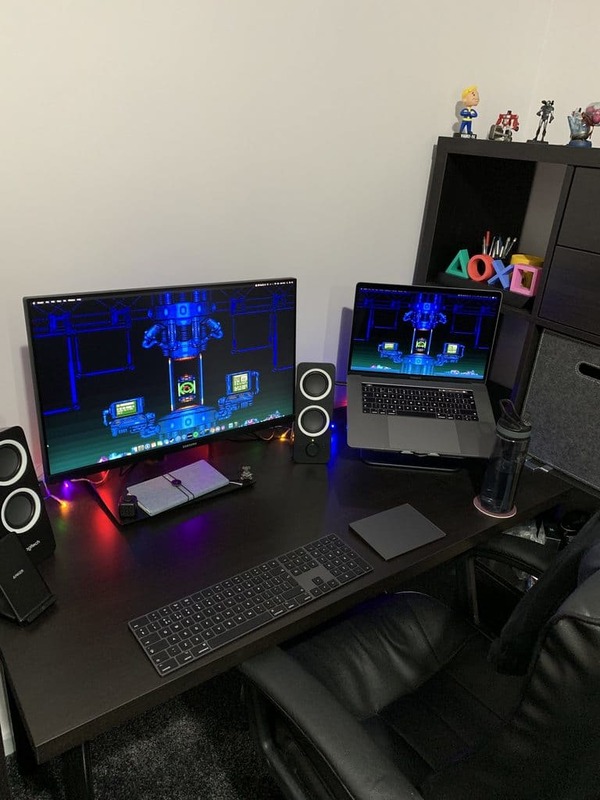 Here is my desk! 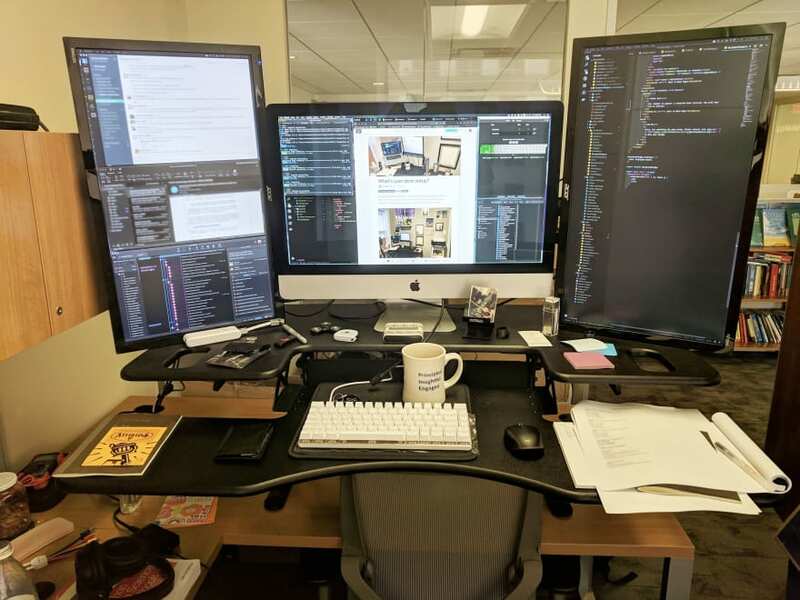 I've got a 27" iMac with two extra 27" monitors on either side, all on a 48" wide Varidesk. Not as tidy as it could be, but I'm in heaven with all the screen real estate. This is my dream desk. Saw in real life. You must be a hacker. 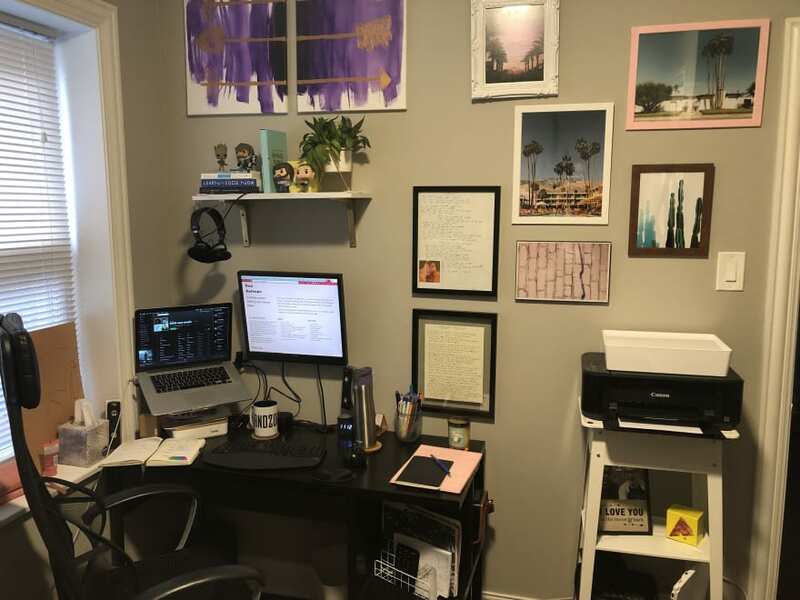 I saw your setup also in another post of you @jess but at this look the bottom of your desk catched my eye. It sure is!! 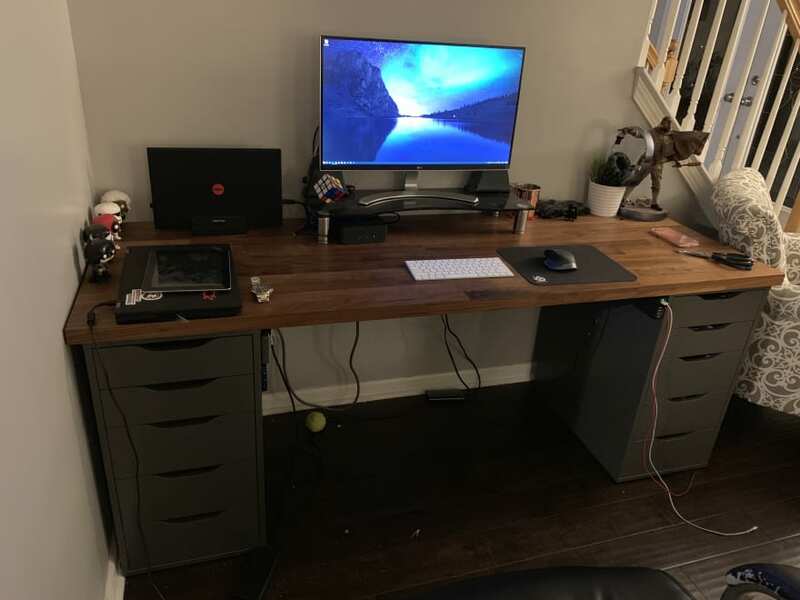 I built the desk with my partner. The tabletop is an old butcher block! What year? I got mine in Oct 2017 and the "home row" keys are gray, thumb keys are white. Also hilarious use of the wrist support. Have you considered a vertical mouse? Hahaha I KNOW. I really regret not getting the black one. I got mine a month ago and I can all the home row keys are going to get so stained. I need to stop eating food on my desk! Oooh, I zoomed in and I see these are labeled keycaps. Mine are profiled instead. Hence the color difference. Since it's so new, does this mean you have hot-swappable switches? What switches did you go with? RE: mouse, I got an Anker AK-98ANWVM-UBA, and was pleasantly surprised. The only thing I'd prefer is if it had wrist support, but for standing/low table that's not an issue. Also wouldn't be an issue for smaller hands, it's nice and large (but light). Obviously not a "gamer performance" product, but on the other hand disposably-priced. Have you tried putting the mouse between the keyboards instead of the right side? I have a similar sewing machine, except mine is complete. That is a cool idea if I find another broken one. Here's mine. I'm new to this office so I haven't added a lot of "personal touches". Minimalist - I like it! But very functional and enjoyable! 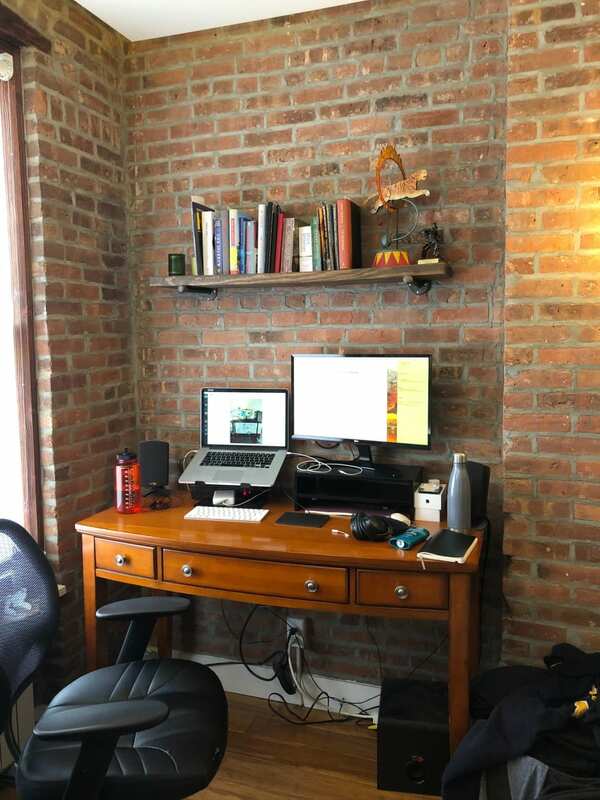 I spent my first ~3ish remote years on my couch and loved it. So comfy and convenient. Ideally, change your seat every two hours. In my office I have a regular seat, a gym ball, and a stool to switch. 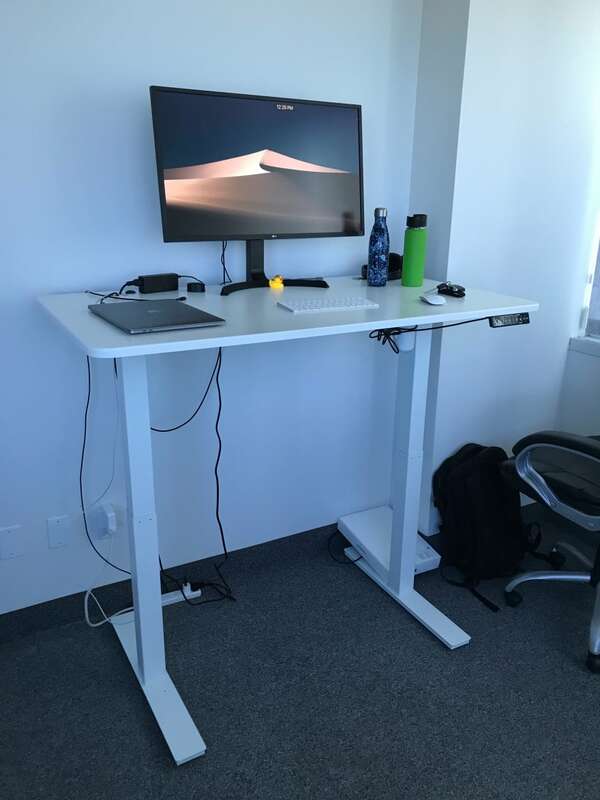 Even better is a height-adjustable desk. Also, take breaks. Stand up, stretch or walk around. The big benefit is being able to switch between Mac and windows with one button press. 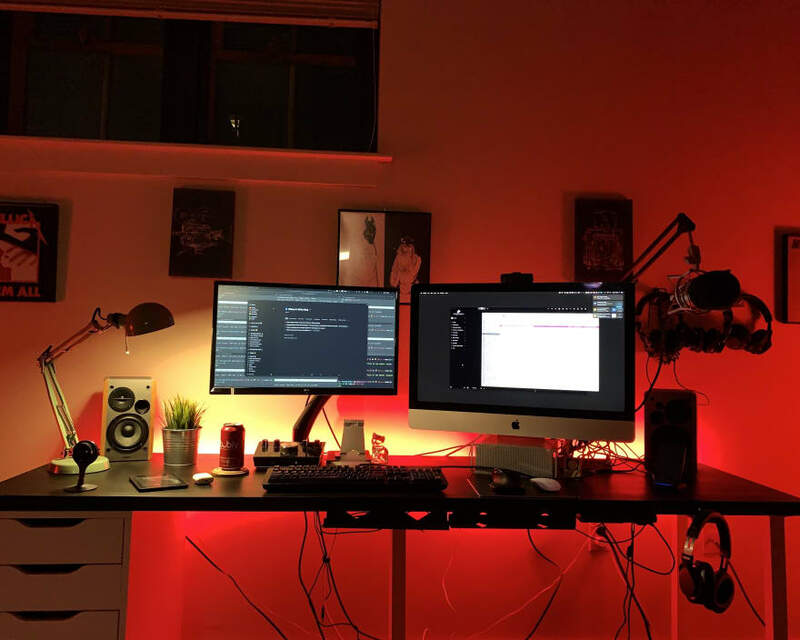 what monitor arm is that? what is the thing you're hanging your headphones on? I love these simple/clean setups! 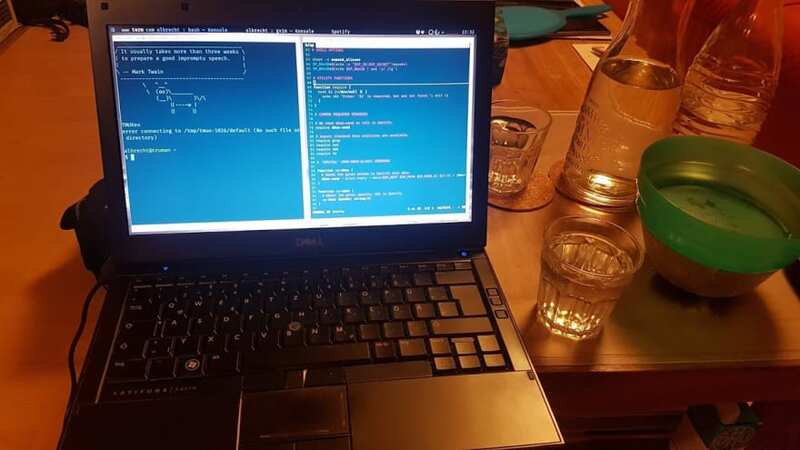 What is this "thing" between cup and laptop, a camera? What do you use to switch between mac and windows with one click? I’m using a usb switch to use the same peripherals across devices. You can see it right below the monitor. I will reply to this later with links to the stuffs. Here's my desk at work. 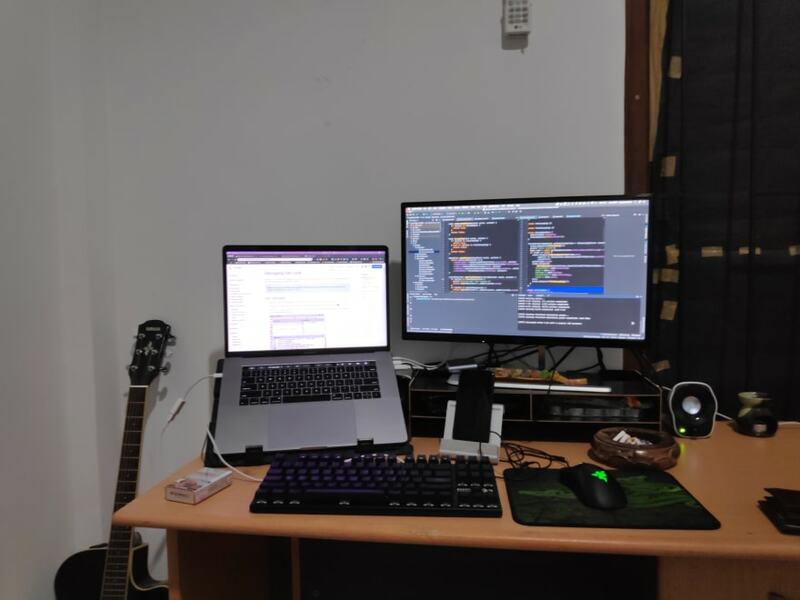 A 21" iMac which I primarily use for the web, a vertical 21" monitor that i use for my IDE, another 21" monitor which I use for for various different things such as tool windows/ iOS/Android emulators / Datagrip. My new Keychron K1 (an amazing low profile mechanical keyboard I backed on Kickstarter), a notebook to jot down ideas/project notes and a whiteboard to draw diagrams. My favourite thing on my desk has to be the Sansevieria. 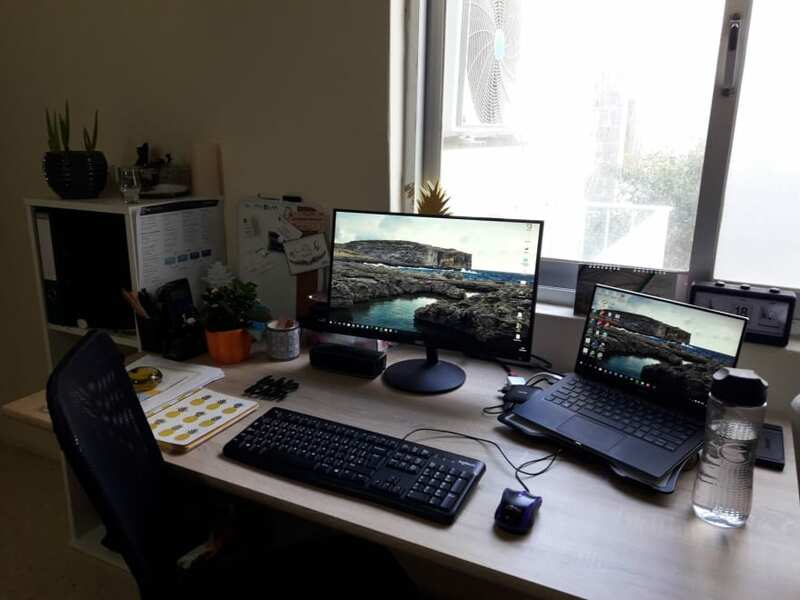 A low maintenance plant that adds some colour to the desk, besides the orange plastered all over the office, and supposedly improves the air quality with the negative ions it gives off. Quite a busy desk but like Tom mentioned it's heaven with the extra screen real estate. The additional productivity gained from the extra screens is incredible. I couldn't imagine going back to a single screen. Edit: Forgot to mention my blue light blocking glasses. It's like turning on the night mode on your phone. 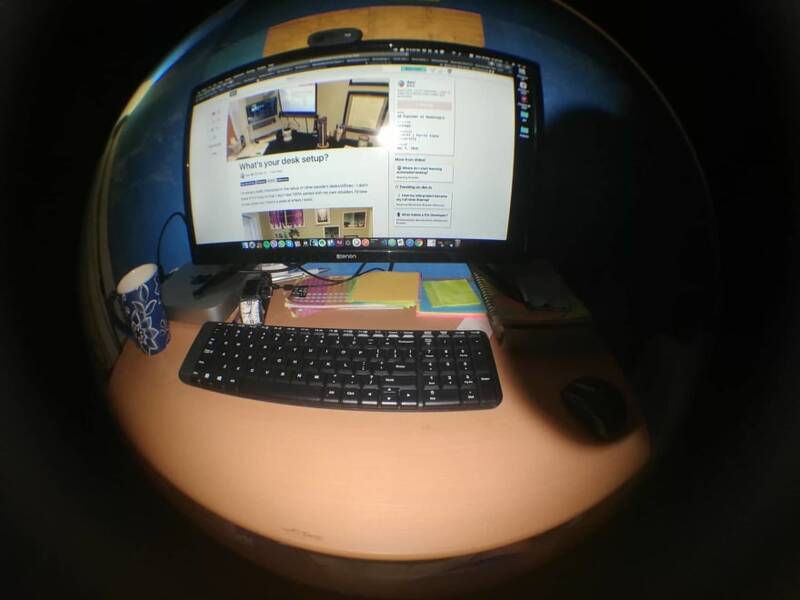 The verdict isn't out yet on how much they prevent eye strain but a nice preventive measure since as developers we spend the entire day staring at screens. A plus point is I look quite good in them 😅. 15" 2017 MacBook Pro with Magic Keyboard and TrackPad all in Space Grey. 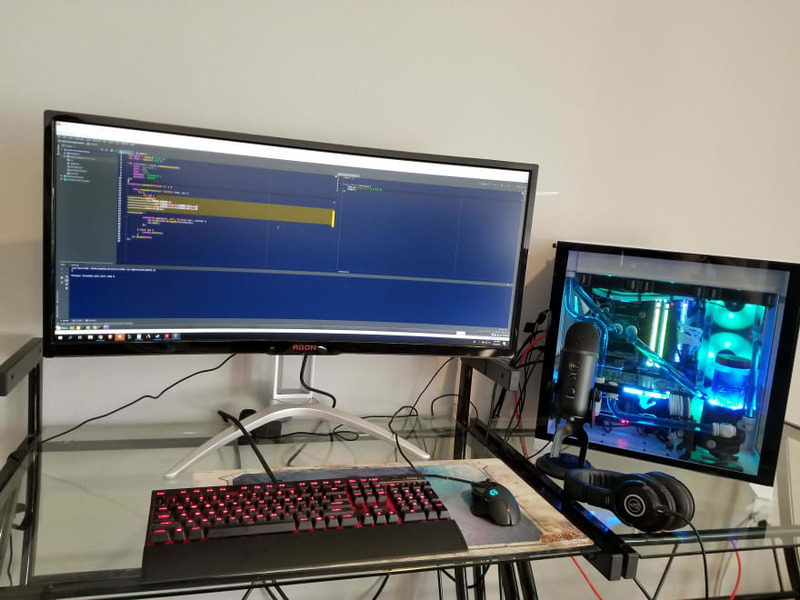 24" 1440p Samsung USB-C Monitor. Logitech speakers and an Anker wireless charger. Also my planner and water bottle which are both essentials, and my Fidget Cube and a little bear paperweight. 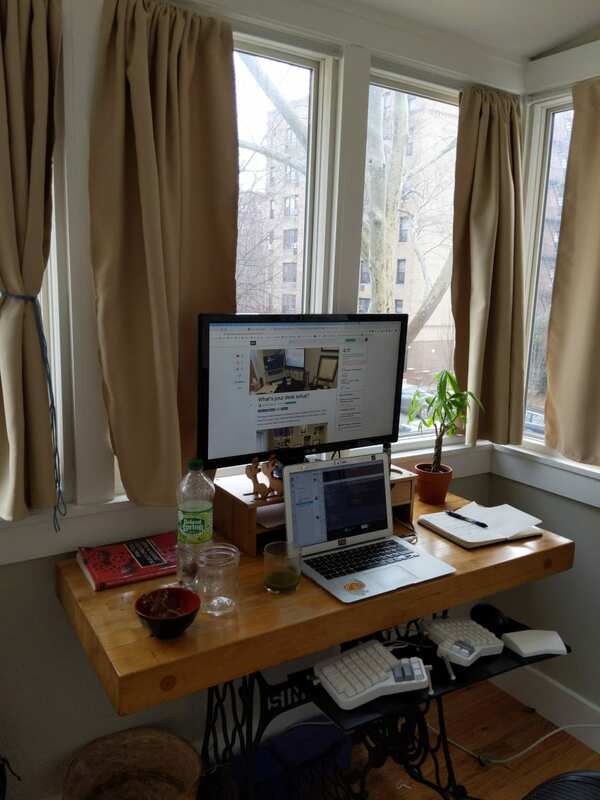 The desk is one of the Kallax storage units from Ikea with the desk attachment and various inserts for the shelves. Also some random USB fairy lights. 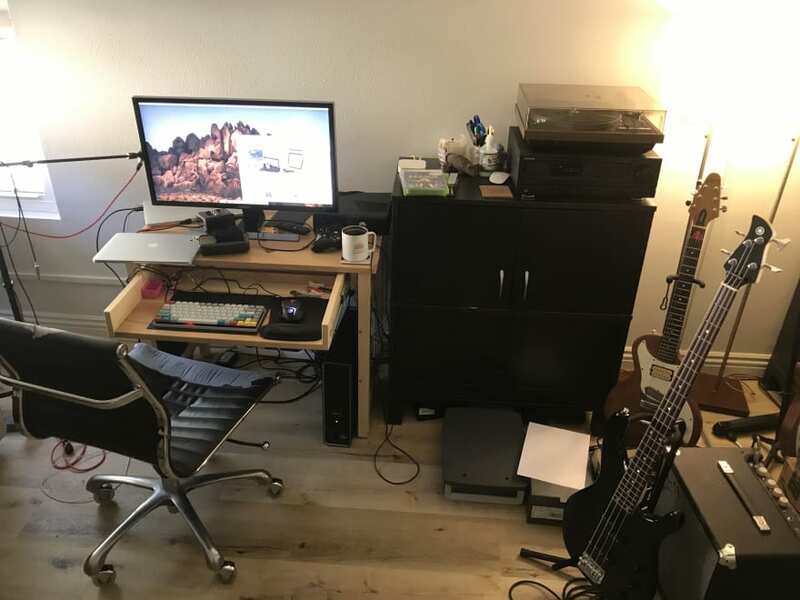 Thanks for sharing - My desk / home office is not tidy enough for me to feel comfortable sharing an image :) That should tell you all you need to know. 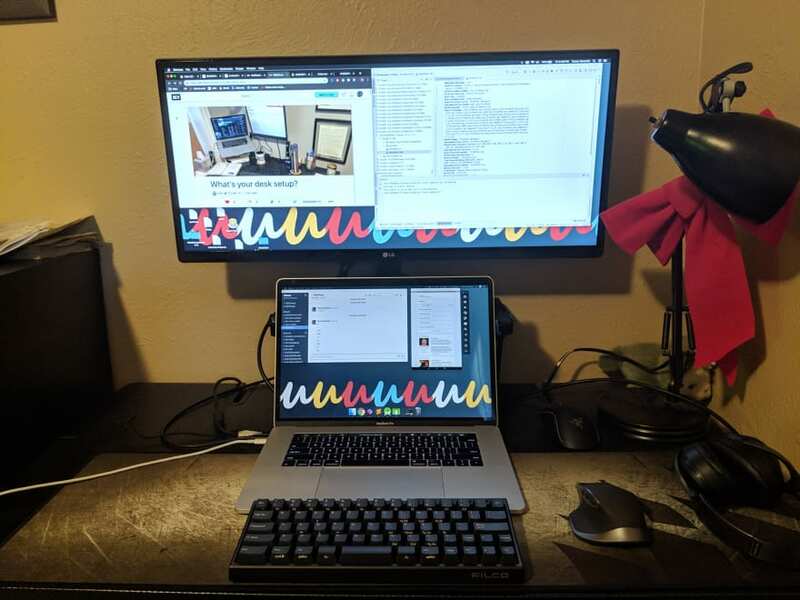 I do have a laptop on a stand and a separate KB and mouse - that part is a win. My screen is a 28" 4K Samsung beast - very productive. 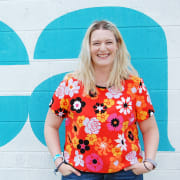 It's Udemy's standard company background! I like it too. 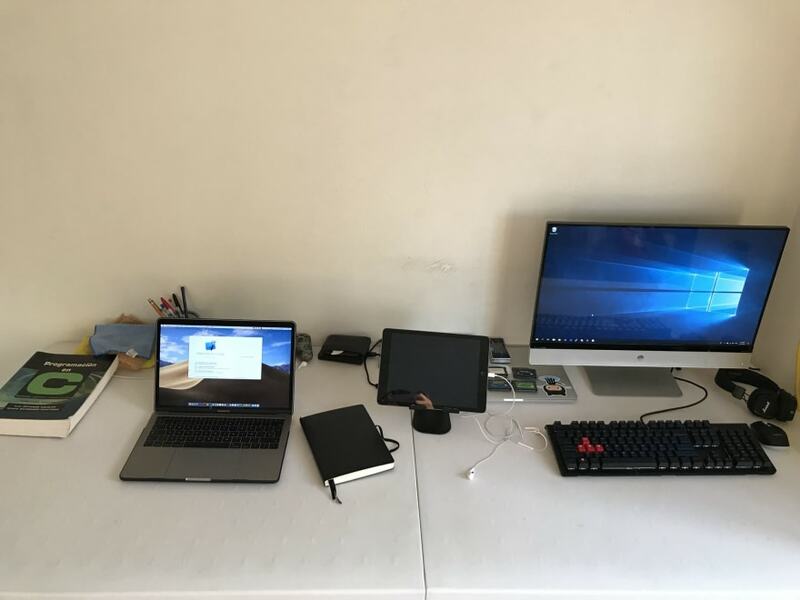 I work from home, but I also have a desk at the office. 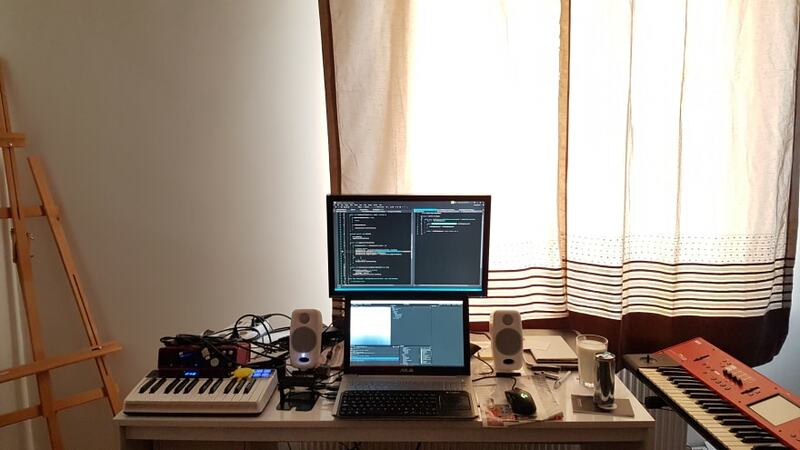 This is my home office. It's a little messy. I need a new chair. 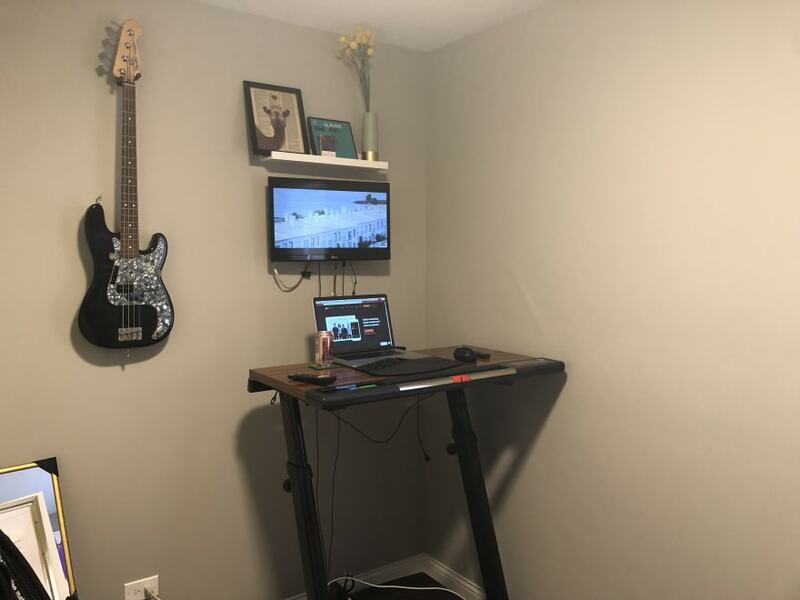 I made the desk. Bit asymmetrical and I'm planning a 3 monitor setup, but i have to get a different desk with a proper chair first. 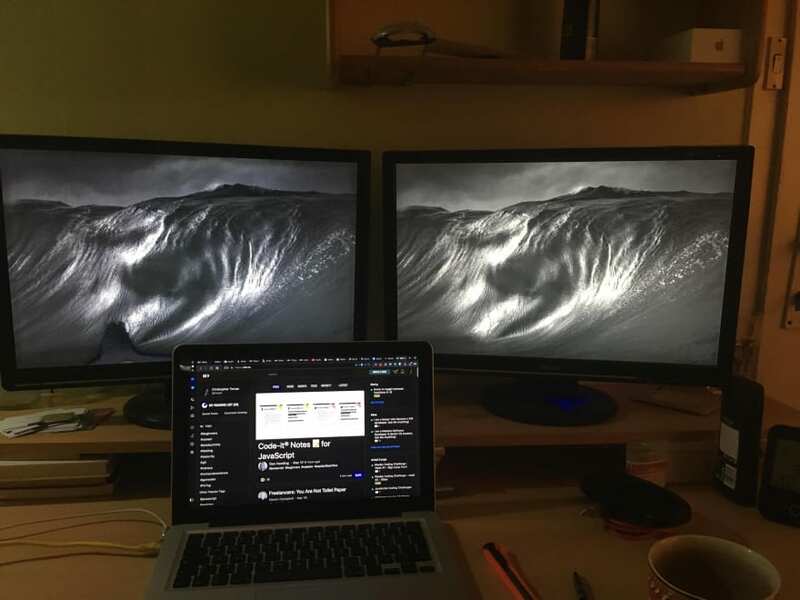 Honestly, can't understand the vertical monitor which i see in the other posts. Seems unpractical, but hey... two monitors in middle doesn't sound much of a win either. Portrait screens FTW. I use one for web browsing, lots of folks use them for IDEs. You need a screen that's better than 1080p though - I've used a pair of 1600x1200 4:3 screens, but replaced them with a single 2K screen. It's really well worth experimenting with. 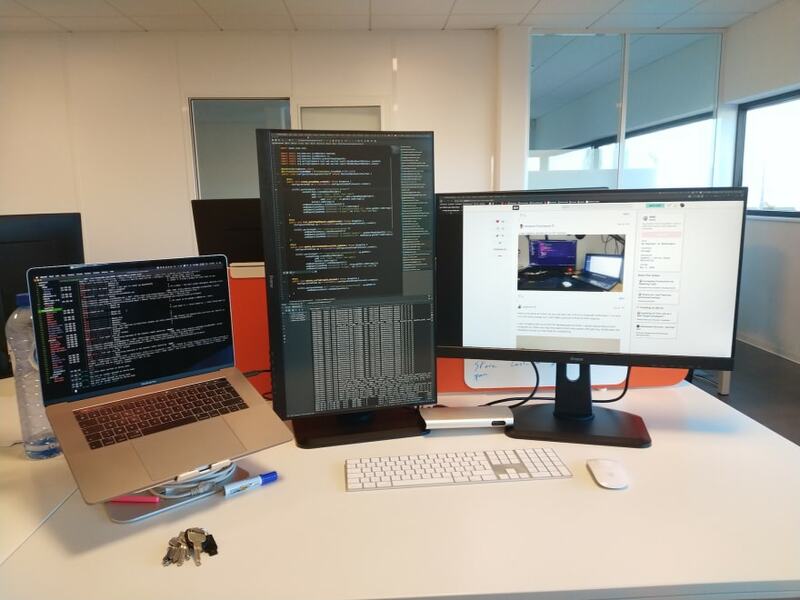 I see, many people say, that the portrait monitors are just to show off :D that it's not even better, usually these people have a widescreen monitor. 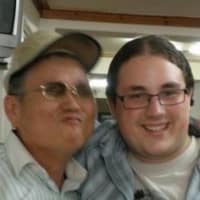 When I'll be redoing my so-ho setup, I'll think about a portrait one. 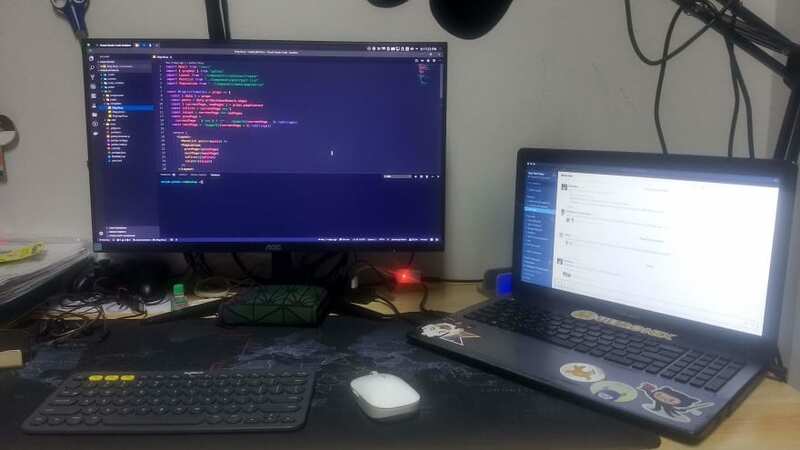 I use manjaro (archlinux) on 24" monitor. 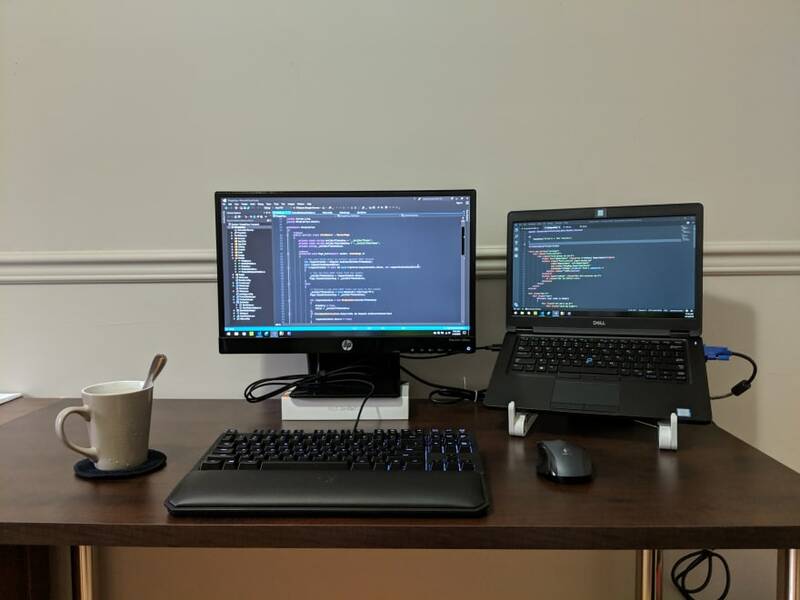 This is my current set up, working remotely from home. No tips on ergonomics, but my Fitbit has been an awesome tool, because it tells me to get up and move around if I have been stationary for too long. Movement solves a host of problems. My current desk at work. Nothing much apart from the dock which is pretty awesome. I plug one cable, it charges, has a network connection and two monitors. Here is mine. A little crowded but it works. This post has become a motivation to replace my long time broken connection for external display. Thanks guys! Thank you. It was my previous profession, now an occasional relaxing escape. 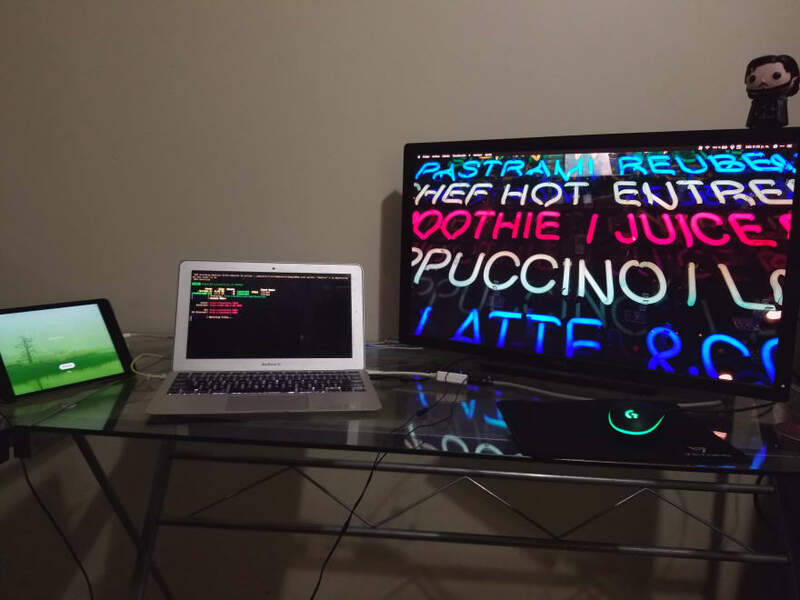 Here is my setup at home. As you can see I am a bit of a computer enthusiast :). At work it is a bit more boring, but I can't take a picture of that for NDA reasons. I use virtualbox with linux mint for development at home. I cannot stand using a slow computer so I have very high end specs which also assists with gaming. Additionally the ultrawide monitor is a real treat for multitasking. Is the mic for streaming? 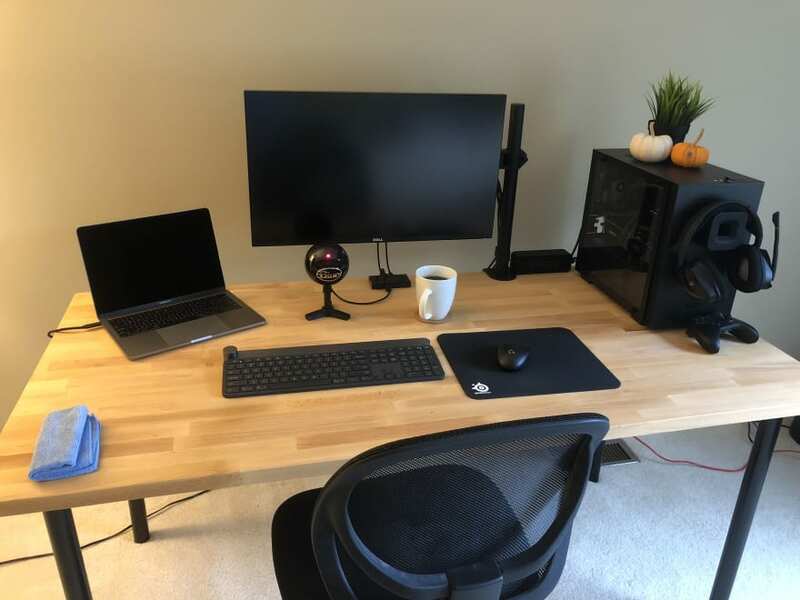 Corsair K70 keyboard, Bird UM1 microphone, the desktop computer's a AMD Ryzen 5 2600 CPU, 16GB DDR4 2666, RX580 Armor GPU with 1TB SSD and 2TB HDD (dualbooting windows and archlinux). Except for the low-price TV, every screen's from the trash. The laptop's a MSI one, can't remember the model. 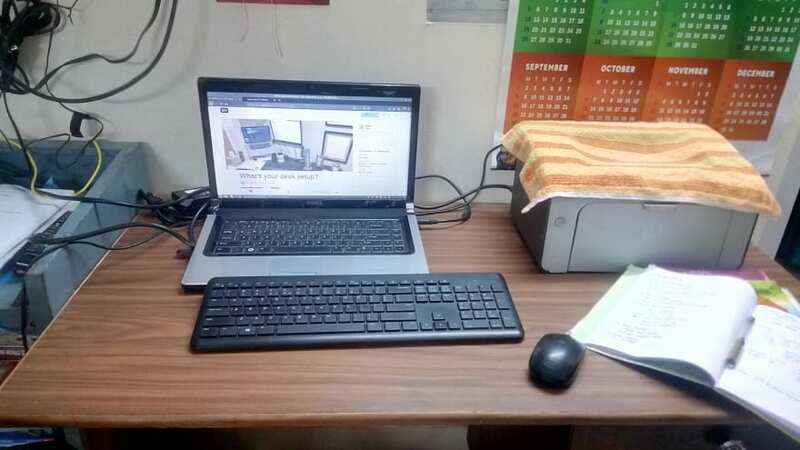 I have my own laptop and a monitor that happened to be available in the office. Here's mine. Cheap and simple! Here's my modest and humble setup. 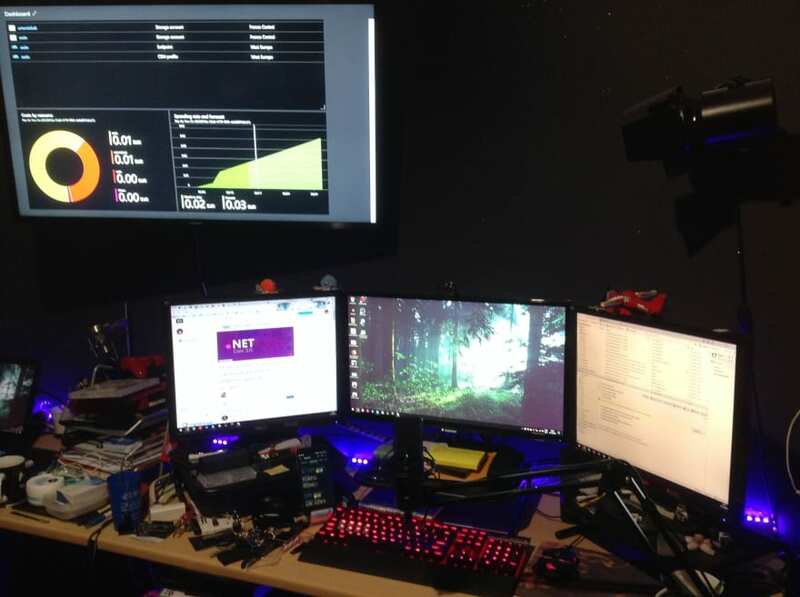 I find more than one screen as a distraction and it might cause alot of eye strain, in the longer run.